The Chandra observations of the peculiar galaxy Arp 220 gives new insight into what happens when two galaxies the size of the Milky Way collide. 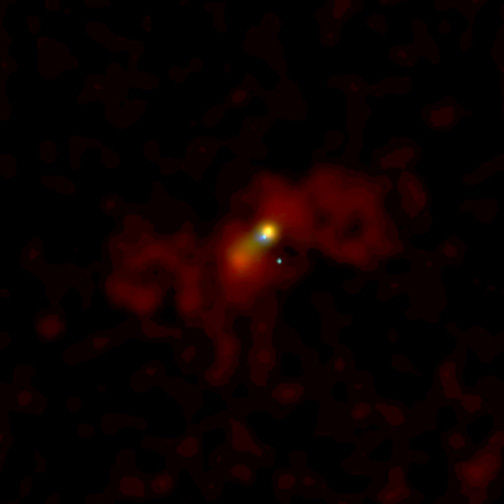 The image shows a bright central region at the waist of a glowing hour-glass-shaped cloud of multimillion degree gas that is rushing out of the galaxy at hundreds of thousands of miles per hour. This "superwind" is thought to be due to explosive activity generated by the formation of hundreds of millions of new stars. Further out, spanning a distance of 75,000 light years, are giant lobes of hot gas. These could be galactic remnants that have been flung into intergalactic space by the early impact of the collision. Whether the lobes will continue to expand into space or fall back into Arp 220 is unknown. In the central region of Arp 220, the Chandra observations allowed astronomers to pinpoint an X-ray source at the exact location of the nucleus of one of the pre-merger galaxies. Another fainter X-ray source nearby may coincide with the nucleus of the other galaxy remnant. 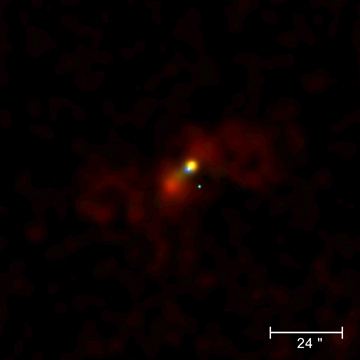 These sources could be due to supermassive black holes at the centers of the merging galaxies. In a few hundred million years the two supermassive black holes could merge to produce a larger, supermassive black hole in the center of the conglomerate galaxy. Arp 220, at a relatively nearby distance of about 250 million light years from Earth, is a prototype for understanding what conditions were like in the early universe when massive galaxies and supermassive black holes may have been formed by numerous galaxy collisions. Scale Image is 2 arcmin per side. Coordinates (J2000) RA 11h 34m 57.1s | Dec +23° 30' 12.00"